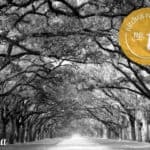 Today’s Hidden Gems travel guide to Athens, Ga. comes from Apryl Chapman Thomas from Southern Hospitality Traveler Magazine! The saying “good things come in small packages” can be applied to Athens, Ga. Athens-Clarke County is the state’s smallest county, but you would never know that when you are here. 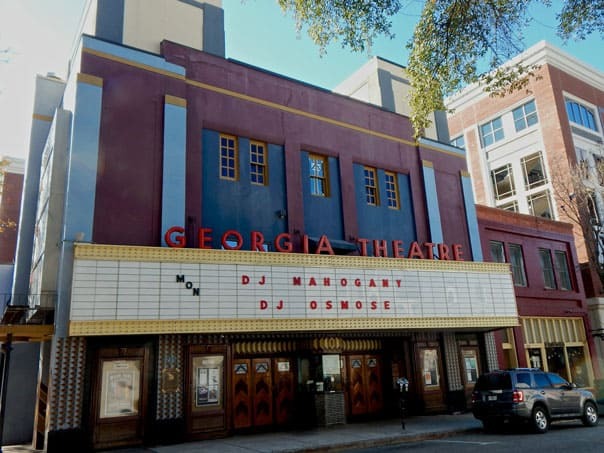 Due to the vibrant arts and music scenes combined with the atmosphere of the University of Georgia (UGA), Athens never slows down and always seems to have something new and fresh to offer. Even though I’ve lived here (and now nearby) for more than 15 years, there is always something new to see, experience or discover, even with the places I frequently visit. Athens’ history is as unique as the modern-day city. 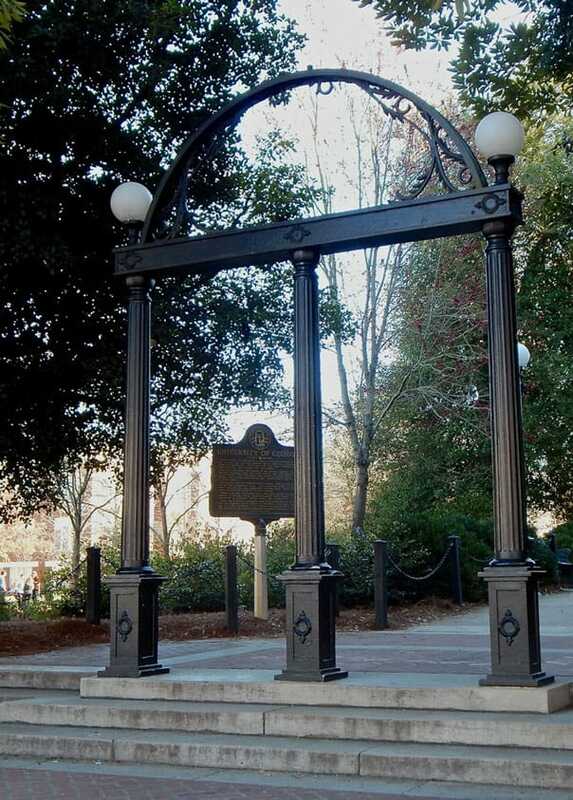 In 1801, a state legislature-appointed committee selected Athens to be the site for the first chartered state university in the country — the University of Georgia. In 1806, Athens, named after the city in Greece, officially became a town. Athens was spared the worst from the Civil War, and you can see many Antebellum structures today. In the late 19th-century, the country’s first garden club was established in an Athens neighborhood. Fast-forward into the early twentieth century, when local Ben Epps built his own plane like the Wright Brothers. More than likely, you’ve heard of the Peabody Awards, which are presented to the media. Well, George Foster Peabody, for whom the awards are named after, was a local philanthropist. Today those awards are overseen by UGA. In 1980s, Athens became internationally known for its music scenes, producing such bands like R.E.M. and The B-52s, and it remains a powerhouse in the music industry. It was also in the 1980s when UGA football made a name for itself when they won the 1980 National Championship. 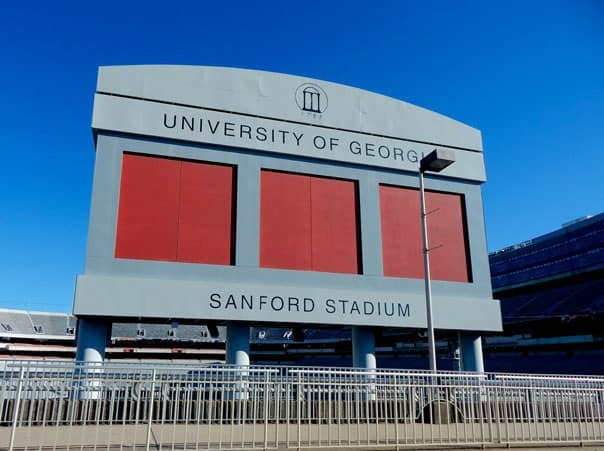 Athens played a role in the 1996 Summer Olympics, hosted in nearby Atlanta, when UGA’s Sanford Stadium was the host site for men’s and women’s soccer medal round. 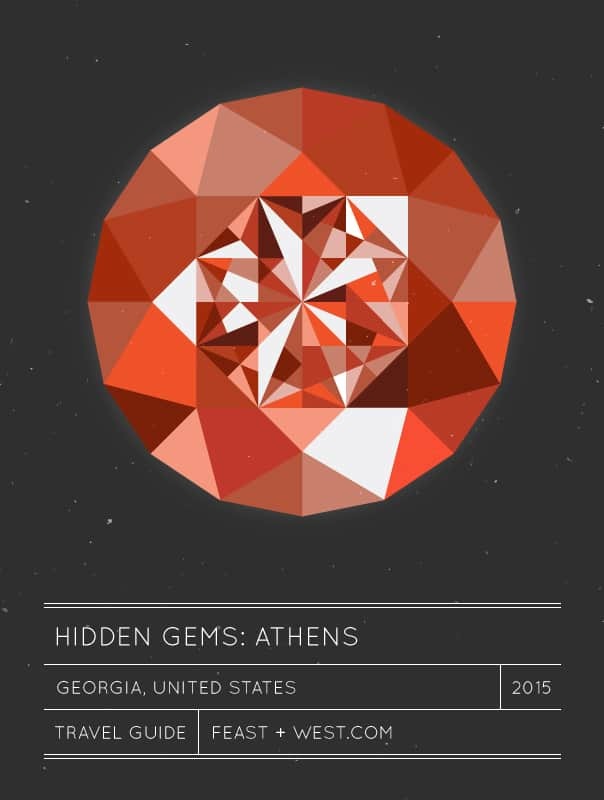 Athens, ever-changing and ever-evolving, still holds on to its southern charm. Offering something for all ages and interest, it’s my pleasure to share with you some of the places I think you can experience the essence of the city. Click below to see more of Apryl’s Athens, GA travel guide! Get your java fix at Jittery Joe’s. It’s a great (and local) way to begin your morning, or take in that much needed pick-me-up. The coffee roasters started in Athens and has grown to other locations in the region and one in Tennessee. Enjoy breakfast or lunch, or a quick treat (think cookie, muffin or pastry) from Big City Bread. You can’t go wrong with anything on the menu. If the weather’s nice, dine outside and people-watch. The Grill, the second oldest restaurant in downtown Athens, is the place to enjoy a burger and milkshake. Open 24 hours, seven days a week, there is plenty of time for you to visit. Great place for families or for those who just like a good burger. Who doesn’t like soda fountains? At Add Drug, you can enjoy breakfast or lunch, or something cold like a malted milkshake or an ice cream float. I recommend ordering either the grilled pimento cheese sandwich or chicken salad sandwich. Their burger is pretty good, too. If you visit on a Saturday, be prepared to wait but it’ll be worth it. Get a scoop of ice cream from Hodgson’s Pharmacy. For good soul food, look no further than Weaver D’s Fine Food. Don’t walk in expecting a light fare. This is fried chicken, mac and cheese and the like. Come hungry because you’ll be well-fed. If his slogan “Automatic for the People” looks familiar, it is. R.E.M. approached him back in the day and asked if they could use it as the title for their 1992 album. 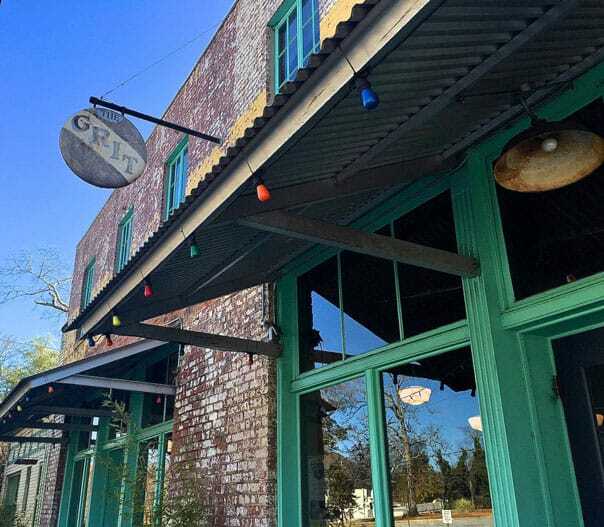 Both vegetarians and non-vegetarians enjoy sitting down to a meal at The Grit. Their grilled cheese and the pasta marinara are two dishes that both camps can enjoy (and share). Growing up relatively close to the Gulf Coast, I consider myself to be a seafood snob. I know what to look for when it comes to seafood dishes and at George’s Lowcountry Table, I was pleasantly surprised. Can’t go wrong ordering the popcorn crawfish, the shrimp remoulade or the shrimp and grits. For those who don’t want seafood, there are dishes like short ribs, meatloaf and Angus hamburger. I admit that about every other week, I enjoy a meal from Peking. It’s really that good, and worth trying when you are in town. Consider ordering their steamed pot stickers, fried rice (I prefer the Peking fried rice, with a little of everything), or their General Tso’s chicken. Cannot talk up enough the chips and salsa at Cali N Tito’s @ La Puerta Del Sol. I could just eat those and be happy. However, for those looking for something more substantial, the restaurant has a lot to offer. Can’t go wrong with their tacos, empanadas or quesadillas. Intimate and casual, The National Restaurant focuses on local fare. Their seasonal menus feature dishes (large plates) like roasted North Georgia chicken breast and grilled pork tenderloin. You can almost make a meal from their small plates like the three cheeses and a pizzette. If you are in the mood for a hearty breakfast plate, head to Strickland’s. A locals’ place, be sure to arrive early or you might miss out on something you’re craving. Eclectic Last Resort is a favorite among visitors and locals. Start with an order of fried green tomatoes, followed by the cornbread crusted trout or salmon and grits. Learn about Athens’ growing culinary scene on the Athens Food Tour. Spend time outdoors by walking along the trails of the North Oconee River Greenway or the Sandy Creek Nature Center. Download and print off the PDF guide for the self-guided Walking Tour of Athens Music History. Learn the background of such sites as the Morton Building, The Georgia Theatre and more. Explore the University of Georgia on your own. Give yourself enough time to stop in both the Georgia Museum of Natural History and the Butts-Mehre Heritage Hall of Sports. Take a break by enjoying Oconee Forest Park, which is on campus. See the double-barreled cannon in front of the courthouse downtown. Tour the official art museum of the state, the Georgia Museum of Art, which holds more than 7,000 objects in its permanent collection. Check out the Tree that Owns Itself. Immerse yourself among the plants and flowers at the State Botanical Gardens of Georgia. Collections include a heritage garden, an international garden and a flower garden. Bears, opossums and alligators (oh my!) are just a few of the animals you can see at Bear Hollow Zoo at Memorial Park. 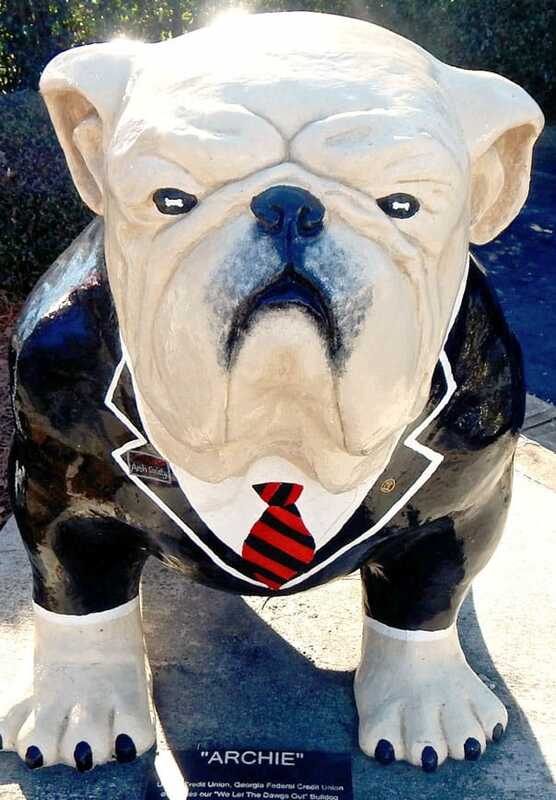 Take a selfie with all of the bulldog statues around town. The outdoor art project, “We Let the Dogs Out” features large bulldogs painted by well-known local artists. Find your favorite one or two. Peruse the art exhibits at Lyndon House Arts Center, followed by a visit to their gift shop. From April to December, Athens Farmers Market is a must-visit. In addition to local produce and food products, you can also find local artisans and craftspeople displaying their items. For me, there is nothing better than beginning a Saturday morning by purchasing a cup of coffee and a pastry, and then leisurely looking at all of the booths. 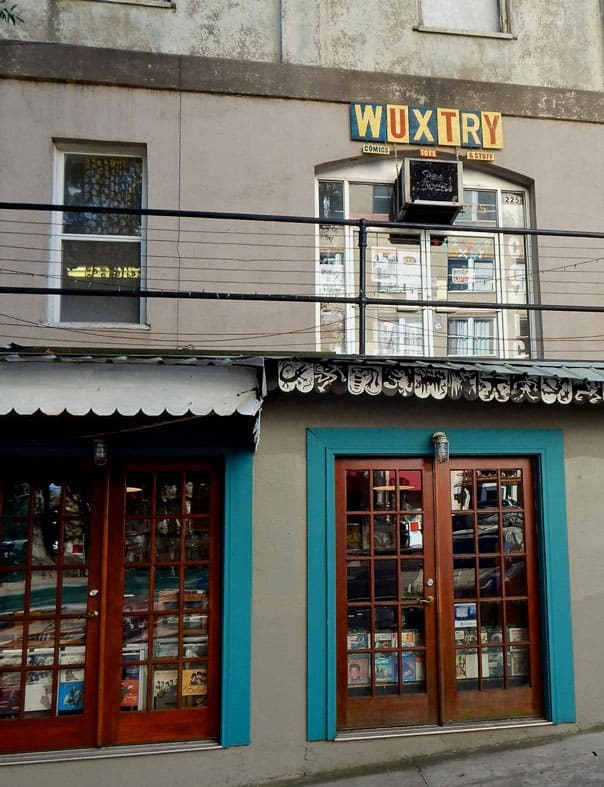 Being a music town, you are going to come across one-of-a-kind music shops like Wuxtry. Go back in time as you flip through the vinyls or check out the CDs. 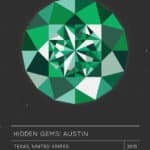 You might discover a new band or two worth checking out, or complete a collection. It’s easy to lose track of time when exploring Frontier. They have a little of bit of everything that you think you might need in your home. If you can walk out of the quaint gift store without buying anything, you have incredible will-power. If you are anything like me, you can never have enough coffee cups, beautiful coffee cups, that is. Visit R. Wood Studios to select one as a souvenir from your Athens visit. If sadly coffee cups aren’t your thing, there is lots of dish ware and funky items to choose from. When I am traveling, I always make it a point to visit locally-owned, independent bookstores. I find them more personal (and interesting) than the run-of-the-mill bookstores. In Athens, there is the Avid Bookshop and Jackson Street Bookstore. 16 minutes, Watkinsville, Ga. — Next door to Athens, browse the local shops in downtown, then swing by Oconee Cultural Arts Foundation (OCAF) for their latest exhibit. Drive out to Happy Valley Pottery and watch artisans at work. 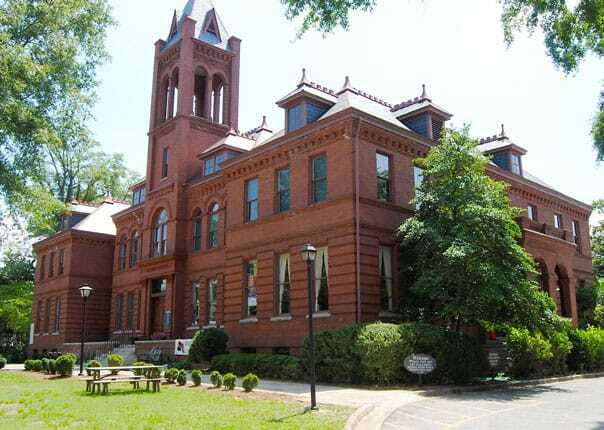 37 minutes, Madison, Ga. — Best known for being spared from flames during Sherman’s march to the sea, downtown Madison is filled with antique shops, specialty stores and eateries. Slow down and enjoy the scenery. Be sure to take a tour of Heritage Hall. 50 minutes, Greensboro, Ga. — Not only is downtown Greensboro is filled with speciality shops and boutiques like Genuine Georgia, it’s also rich in history. 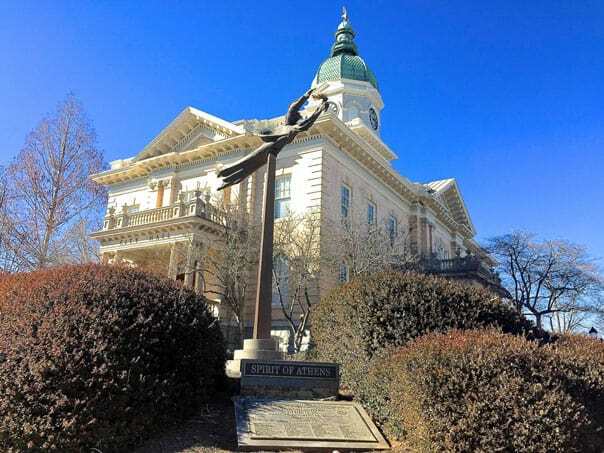 The town is home to the third oldest courthouse in the state that is still being used today. You can also see the old Green County “Gaol” (jail), one of the oldest in the state. Be sure to stop by Yesterday Cafe to enjoy a slice of buttermilk pie and Potted Geranium for tea. 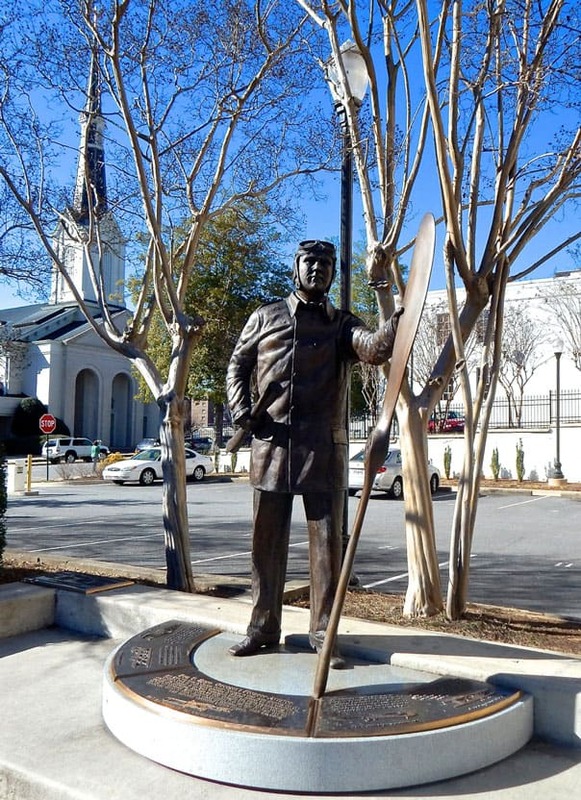 1 hour, Eatonton, Ga. — Eatonton is the home of authors Alice Walker and Joel Chandler Harris. Take the Alice Walker Driving Tour as well as visit the Uncle Remus Museum. Make time to stroll the historic downtown area. If you enjoy spending time outdoors, be sure to check out the Rock Eagle effigy or hike out to view Rock Hawk effigy. 55 minutes, Washington, Ga. — Washington is home to the largest number of antebellum structures in the state. Tour the intact Callaway Plantation, built in 1868. It was the living quarters for the family on a 3,000-acre cotton plantation. The Washington Historical Museum’s collections include Civil War artifacts and Native American relics. 1 hour and 20 minutes, White County — White County offers visitors two main communities of Helen and Cleveland, both distinctly different from one another. 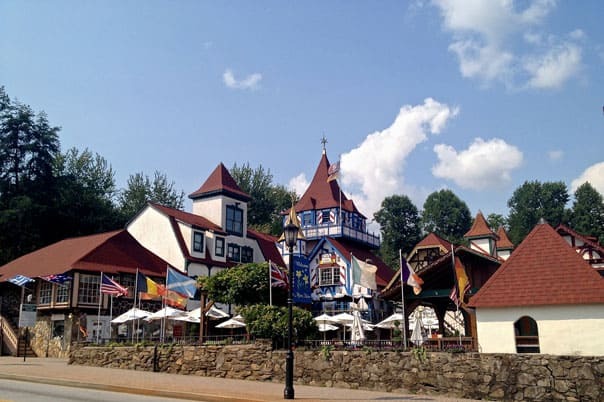 Helen is a replica of an Alpine Village filled with shops and eateries. You can spend an afternoon exploring the village. Be sure to stop in Charlemagne’s Kingdom to see a detailed railroad model of Germany, and then get a goodie from Hofer’s Bakery & Cafe. For the outdoorsy-types, head to Anna Ruby Falls. Drive through Unicoi State Park to access the falls’ visitor’s center. There is a paved path that takes you to view the falls. There are more challenging trails as well, if you are up to it. A very short drive from Helen is Village of Sautee. Here, you’ll discover Georgia wineries and more local shops. In Cleveland, stop in Babyland General, home of the Cabbage Patch Kids and a place everyone should experience at least once in their life. Time your visit right and you may be there for a “birth.” Sample local wine at Yonah Mountain Vineyards. 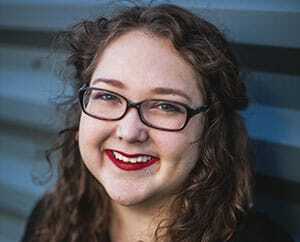 Apryl Chapman Thomas is the feature writer for Southern Hospitality Traveler Magazine and their blog, Happening Now, both focusing on everything south. You can follow her on Twitter to keep up with her latest travels throughout the South. Thank you! 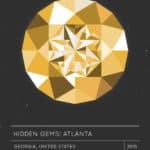 I highly recommending see as much as Georgia as you can. There are plenty of interesting and fun destinations. Oh, Savannah! It is the sweetest, loveliest place. I am sure you would like Athens too, Amy! 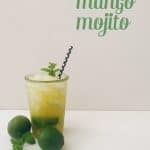 I couldn’t stop thinking about you while I worked with Apryl on this post! I haven’t been to Athens in so long, but there is so much more to it than I ever thought. Thanks for the tip about the breweries!